Back in the early 1990s, we knew that cannibalization existed. If we mailed a title twelve times a year, and then we added a second title and mailed it twelve times a year to the same circulation quality/depth, we didn't get a two-fold increase in sales, did we? And then the internet came along. Today, catalog frequency and page counts are a highly sensitive topic. Merchant: "The catalog is 144 pages, and I only have 24 pages to show my product. I need 36 pages. Please add 12 pages, make the catalog 156 pages. Thank you." Kevin: "The catalog will be less profitable at 156 pages. In fact, the catalog shouldn't even be 144 pages, it should be 64 pages with call-outs to key landing pages." Merchants: "You can't sell product unless you show the customer the product. I need an additional 12 pages. Please add the pages to the assortment. Thanks." Kevin: "Why don't you feature your products in e-mail campaigns. Your e-mail campaigns go to over a million subscribers, three times a week." Merchant: "Real customers use catalogs, hardly anybody shops from e-mail campaigns. Our catalogs generate $3.00 per book, we're luck to get $0.15 per e-mail, and that only happens when we offer 20% off and free shipping." Kevin: "What about your website? Only 4.8% of your customers convert when they visit the website. Why don't you spend time getting that rate up to 6.0% for your customers, you'll increase demand by twenty-five percent." Merchant: "Our IT team won't let us touch the website." Kevin: "What about search? Why not partner with your vendor to maximize the search performance of your division?" Merchant: "Is that where we have to do all of that fancy bidding? I don't even know what that's all about. Just let me add the pages to the catalog." Kevin: "What about social media? Have you built a deep, emotional connection with your fans?" Merchant: "Do you know how much work that requires? And at the end of the day, I have fans, but I don't necessarily have sales. Just let me add the pages to the catalog." Eventually, the merchant beats people down, getting his/her way ... sales increase, profit decreases, page counts increase, circulation depth decreases, prospecting decreases, the customer file erodes, and the business slowly sinks into a murky pool of warm tar. In the post-internet era, page counts are death. As pages increase, demand increases at a ever-decreasing rate, yielding less and less incremental profit. The problem, of course, is that the Circulation Manager sees 132 pages and $0.49 of profit and says, "yup, that works!" It doesn't work. It's simply wasteful. These days, 3+3=4. It's a relationship that subtly destroys the profitability of a catalog business in the internet era. Testing indicates that the future of catalog marketing is all about small catalogs with a highly targeted assortment to a rural, older audience. Contact me now to help you solve the page/frequency problem. Purchase Hillstrom's Catalog PhD in Print, $7.95. 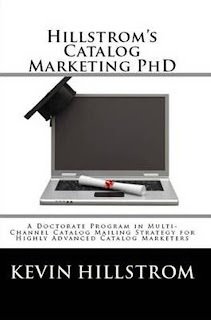 Purchase Hillstrom's Catalog PhD via Kindle, $2.99.